An '01 award pin for shooting a hat trick (three darts in the bull). 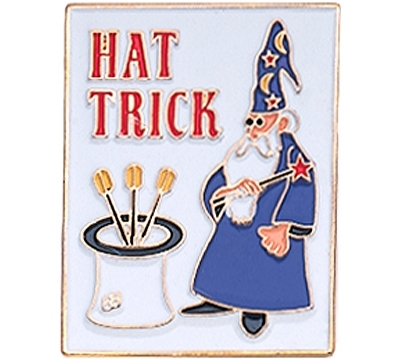 Can also be used for a Cricket Hat Trick if needed (specific Cricket Hat Trick pin sold separately). Made of heavy die-struck metal, cloisonne'-coated. 1" wide x 1-1/4" high.